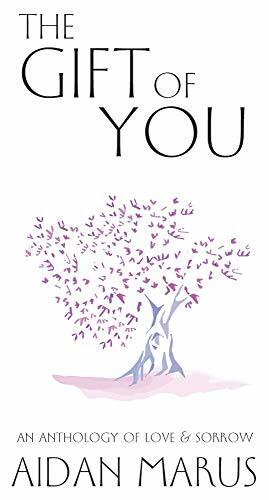 The Gift of You: An Anthology of Love & Sorrow <— Aidan Marus is today’s “Friday Finds” newsletter sponsor and I am THRILLED to have him with us today, ’cause… oh myyyyy that title just squeeeeeeezes my heart. A different format from our usual romance reads, but a love story nonetheless. Real life. It was recently released (in January) and Aidan just reached out to me about it and sent me my very own copy. How could I resist something so bittersweet and heartfelt? The minute I read his email to me (and the blurb), my heart melted. “It is a collection of stylized letters that I had written for my girlfriend at the time, after I found out she had to leave the state to start a new life. She had asked that I put them together in a book before we saw each other for the last time, and I did. And then I dipped my toe into his personal turmoil and wow. Lyrical heaven. I will read this in its entirety. And probably cry my eyes out. Oh wow, you guys… to be loved so intensely, so purely and unconditionally, that even separation cannot ever take that away. To end, not because you want to end, but because you have to. All of this, love and wonder and heartache… conveyed via sublime prose. Immerse yourself in a dreamlike world and experience poetic visions of true love, divine beauty, and the enduring pain of a broken heart. These stylized letters were originally written for a loved one to celebrate their time spent together after it was discovered she would leave town to start a new life. At her request, the letters were put together in a book to be shared with the world. Oh how I hope there’s a second chance love story for them. I really do. And thank you for sharing this with us. When Aidan was a little boy, he believed that one day he would become an astronaut, a scientist, a boxer, Indiana Jones, and Superman, all the while saving people and exploring the world. The one thing that he thought he could never do was write a book. Years later he found solace and inspiration in reading works by the likes of Khalil Gibran and Epictetus, and began writing snippets for himself as a hobby and a way to focus his thoughts. In time, and with strong encouragement from friends, he was convinced to publish some of his personal writings. Many of his works are stylized, infused with hidden meanings and philosophical undertones that are the result of reading old philosophical texts translated in antiquated form, and an affinity for classic books like “The Prophet” and “The Apology”. Thanks for the recommendation. Blizzard + new book, I’m not completely mad about it.